This is such a strange blog for me. Until I was 22 and in the Peace Corps I had never had a beer I liked. In fact, if asked, I would say I didn't like beer at all. But as a survival tactic in a place where you couldn't drink the water unless you boiled it, I learned to "like" beer. It was either that or Coca Cola...way to sweet for me! Then when I got back to the States, I went back to just drinking wine. It has been that way for many, many years. 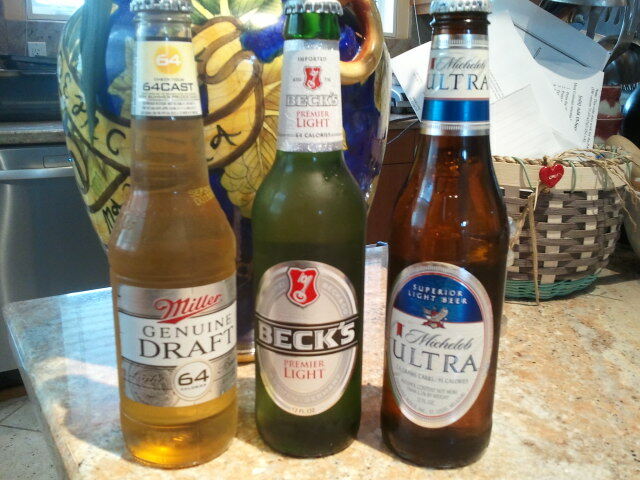 On occasion when my adult kids are around who like beer, I will drink one of theirs. That was until I started on this Healthy Lifestyle Journey. What shocked me the first time I went to buy these light beers is that you can't buy most of them at a liquor store because they are too low in alcohol content (beertutor.com)! This made me smile because buying light beers also turns out to be way more convenient since I can go to the grocery store and do one stop shopping. I am liking light beers more and more!